Celebrate Chinese New Year at Intertops Casino with an 150% match bonus and 33 free spins on the brand new Pig Winner slot! Redeem the coupon code PIGWIN before your next deposit of $20 or more to claim your 150% bonus and 33 free spins. After you test your luck with the new game, please share your Pig Winner slot reviews. Good luck! Free Spins Game: Cubee slot. This promotion expires on February 28th, 2019. Minimum deposit amount is USD 20. Max. bonus amount is USD 500. The free spins are only valid for "Cubee". Any winnings from the free spins are subject to a playthrough of 10x. Standard wagering requirements apply for the deposit bonus. Enjoy colorful fun with our unparalleled Animal Carnival. Prizes worth $150,000 are up for grabs at Intertops Casino. An energetic special cash prize awaits one lucky player at promotion's end - join to find out if luck is on your side! 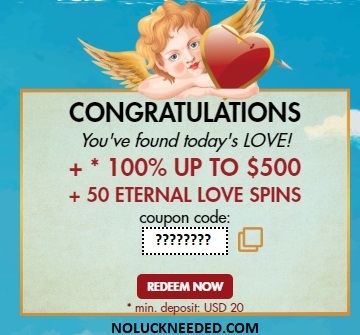 CONGRATULATIONS You've found today's LOVE! slots wagering requirement: 60x; max. cashout: USD 200; max bet rule, Standard bonus terms apply. Do not claim two free bonuses in a row. Valid 2/11 until expiration date unknown. This offer is valid one more week!